This delightful couple's wedding ceremony took place at beautiful Saint Agnes Catholic Church in downtown Baton Rouge, Louisiana. In this photograph, the newly married bride and groom walk down the aisle as husband and wife at the conclusion of their ceremony, preparing to head for the reception at Louisiana State University's Lod Cook Alumni Center. 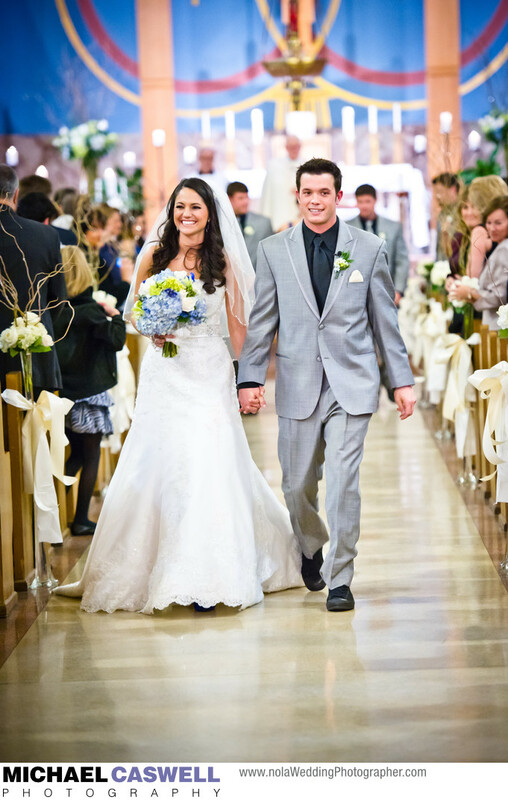 This couple's wedding took place on a cool and crisp January Friday evening. I've been told that it's actually quite rare for a Catholic wedding to be held on a Saturday evening in Baton Rouge, due to the Diocese being concerned about Saturday nuptial events interfering with the integrity of the following morning's mass celebration. Churches in New Orleans are generally less restrictive about this, and Saturday weddings are far more common here. Location: 749 East Blvd, Baton Rouge, LA 70802.